Written and illustrated by Dietrich Varez. Born on a stormy night full of intrigue and mystery, Hina, The Goddess has origins almost as wondrous as the tales of Hina herself. While viewing performances of the powerful and ancient Kahiko form of hula at the 1986 Merrie Monarch Festival in Hilo, Hawaii, the audience had an unforgettable experience. A raging storm swept over Hilo. 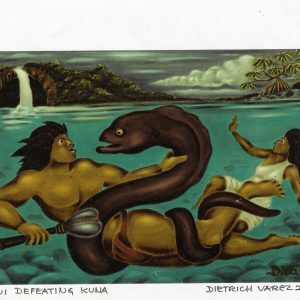 Thunder clapped and lightning struck, plunging the entire town of Hilo, including the festival, into utter darkness. 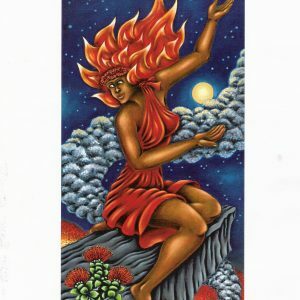 Many wondered if it was mere coincidence that the evening s events included a compulsory chant for the wahine which spoke of Hina and the gourd calabash in which she captured three windstorms. Known for her forceful ways and power over the physical world, Hina is not to be taken lightly. One halau took this sign from the heavens so seriously that they withdrew from the competition. 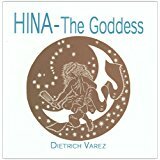 Dietrich Varez was so struck by this incident and the power of the chant, he was inspired to create the first of the block prints appearing in Hina, The Goddess picturing Hina with her calabash. 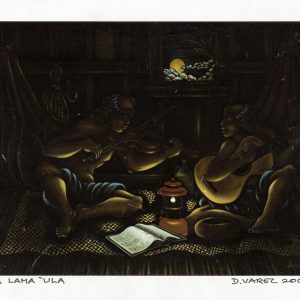 As his interest was piqued, he went on to delve further into the mythology of Hina in her many forms and from his research was inspired to create a series of block prints representing the many amazing and varied tales associated with Hina. Petroglyph Press is proud to present this culmination of experience, imagination and talent so vividly portrayed in Varez s signature style block prints and corresponding legends. We believe you, too, will feel the presence of the goddess Hina as you read this book. 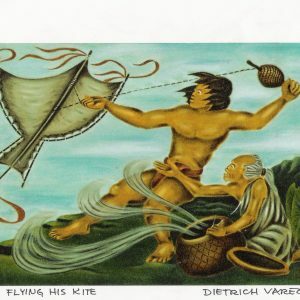 You can learn more about Dietrich Varez by visiting his bio page here.